This volume provides a comprehensive, up-to-date account of how the physical and biological environment of the Antarctic continent and Southern Ocean has changed from Deep Time until the present day. It also considers how the Antarctic environment may change over the next century in a world where greenhouse gas concentrations are much higher than occurred over the last few centuries. The Antarctic is a highly coupled system with non-linear interactions between the atmosphere, ocean, ice and biota, along with complex links to the rest of the Earth system. 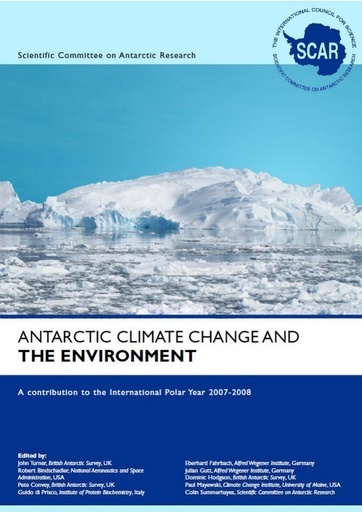 In preparing this volume our approach has been highly cross-disciplinary, with the goal of reflecting the importance of the continent in global issues, such as sea level rise, the separation of natural climate variability from anthropogenic influences, food stocks, biodiversity and carbon uptake by the ocean. One hundred experts in Antarctic science have contributed and drafts of the manuscript were reviewed by over 200 scientists. We hope that it will be of value to all scientists with an interest in the Antarctic continent and the Southern Ocean, policy makers and those concerned with the deployment of observing systems and the development of climate models. See also the pdf Addendum and Corrections (37 KB) to the original.